Given that we had just spent nearly 9 days exploring the importance of feedback it is not too surprising that I am responding to feedback from one of the student trainers in my group. 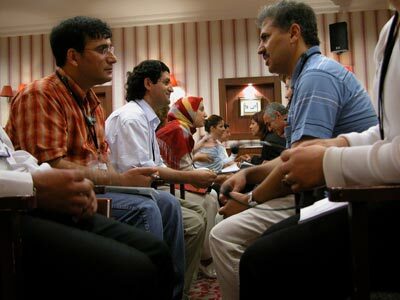 I read the first article that I wrote about my experience here in Turkey to the group on the course and one of the participants had noted my reference to the ‘noise, noise, noise’. Unbeknown to me she had decided to give me some feedback of the experiential kind (she had learnt well) and she invited me and my son and his girlfriend out to drive round other parts of Istanbul that we might not have seen. And I saw a completely different side to this vast sprawling city. I saw the gleaming business towers, the wooden mansions that line the marinas filled with luxury yachts. I saw the historic balconied wooden buildings perched on precipitous street sides that would challenge any one who had not mastered their hill starts. Not the place for a learner driver here. I raced to capture the images tht unfolde outside the car window and my friend asked if I would like to stop at her offices to take some photos. Courteously I agreed and as we pulled up outside two towering iron gates they slowly parted and what I thought was park and gardens inside. Then I realised that these were the offices perched on a hillside overlooking the twin bridges that span the Bosphorus. This luxuriant green garden of Eden overlooking what must be one of the busiest ports in the world was sheer peace and my generalisations of the nature of Istanbul were shattered. A place and a people of surprises – this was a metaphor for my time here running this trainer training course. The delegates were skilled and educated not only in NLP but in many similar philosophies and concepts. The course was populated with business people and teachers, sales people and therapists. And I realised that all my assumptions about Turkey and how it was to train here were being challenged. I am not sure whose learning was the most intense mine or theirs….. We studied how to immerse ourselves in feedback so that we might learn from every person and every moment of the day. I learned about the sensory rich customs of Turkey that included dance and song and story telling. And I brought my awareness and teachings of clean space and feedback and an ability to be in the moment and teach from that place. Was it Parker J Palmer in The Courage to Teach who said that true teaching was like standing in the middle of the junction on a major highway with traffic coming at you from every direction and we did that literally in our training sessions and metaphorically every day as we crossed Taksim square to take our lunch. We explored how to celebrate excellence in every one with whom we came into contact and the culmination of this was finding the diamond of our unique contribution to the world in every one on the programme. I left Istanbul today to return home and I do so with every intention of returning for another Trainer Training in January 2006 to learn more about how our different rich cultures can integrate in such a rewarding and insightful way. Thank you to NLP Grup who made this time for me and my family who joined me there so special and to the group who reminded me how to truly keep an open mind to others’ maps of the world….. Istanbul is a part of the map of the world to which I am keen to return.